RUSH: This is Janet, Newport, Washington. Great to have you. CALLER: Oh, Rush, thank you so much for taking my call. I’ll make this brief. I guess I am the most liberated woman in the United States because I am ex-military and ex-law enforcement. I’m not a Joe Biden fan, but I do not understand how these high-powered educated women can wait years and years and years to come out and say that Joe Biden made them uncomfortable. They are as much at fault as Joe is. RUSH: Well, wait, now. 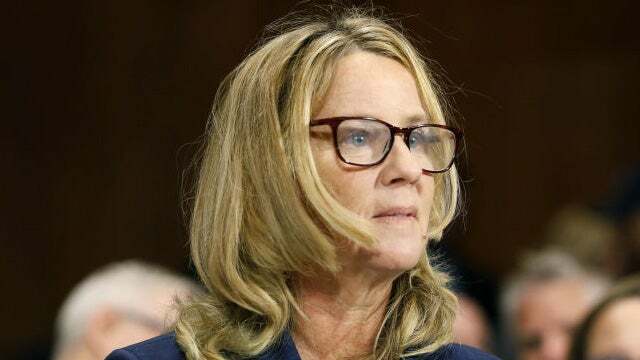 Why did Christine Blasey Ford wait 30 years to come out and get Kavanaugh? RUSH: There is a reason for it, and it’s nothing but politics. Like this woman from Nevada that really got all this started with Biden, talked about how terrified she was, he’s back there nuzzling her neck and smelling her hair and his hands were groping all over and so forth, and your point is, why not say so at the time? CALLER: Well, yes. Any reasonable woman would do that, and we don’t have to have a college education or be a politician to tell someone “no.” And if they have waited this long, then I say forget it. RUSH: Well, I understand what you’re saying. I have a little different theory. I think the entire militant — and there are many different so-called feminist movements — but the militant feminist movement, which I define as being the radical left political version of it, really requires women to be helpless victims like every other Democrat constituent. RUSH: And these women seem to be willing to play along with this. “Okay. I’ll pretend to be a victim, a helpless victim. I could not have stopped that guy smelling my hair. I need to go public 30 years later and make sure his career is ruined, because I support Bernie Sanders and I don’t want –” It’s all politics. And in the process of this, these women are allowing themselves to be portrayed as helpless. And this is what offends you. You’re ex-law enforcement, ex-military, and you’re not helpless. And you don’t want to be seen that way. But they are willing to have themselves seen as victims with great abuse perpetrated against them and they were powerless to do anything about it ’cause that’s how the left’s political agenda is advanced among women, by creating even more and more women who think that way. But the fact of the matter is if you run into a woman who is confident and well adjusted, she can shut that down the first time it happens in 10 seconds and walk away from it or deal with it some other way, I’m sure the way you do, and not hold on to it for 30 years and claim that it destroyed her life and made her afraid every day to go out in public or whatever they say. It really ends up being demeaning to all women because it portrays them as helpless victims of whatever kind of man, a powerful political guy or a physical brute kind of guy or whatever rotten characterization of men happens to be popular at that particular point in time. CALLER: Rush, you are exactly right. RUSH: Well, I’m used to it. RUSH: I’m used to be being right, not the treatment of women. But no, I know what you’re saying is why you think I’m right. I know exactly why. Because you’re self-reliant, you’re self-sufficient, and you’re not straight out of a movie like The Handmaid’s Tale or some other portrayal of women as hopelessly victimized and paralyzed by brutes like Harvey Weinstein and so forth. All of this stuff that’s ostensibly to empower women is actually doing nothing of the kind. It’s making them appear to be powerless victims, and they seem to be embracing that. That is what I think really offends you, because that isn’t who you are, and it’s not necessary. You don’t have to go through life being afraid of men. I mean, men and women are different, and men are gonna behave, and women grow up learning these things, and they grow up learning how to deal with it. But some women apparently aren’t because they’re being told it’s not even to be permitted. It’s fascinating, too, Joe Biden’s been doing this for how many years and how many people are say, “Oh, we’ve known Joe has been doing this forever. This is just Joe,” meaning it never bothered anybody until he became the frontrunner in the Democrat primary setup. RUSH: No. And they’re never find you. The Drive-By Media will never find you to let you say what you say because you don’t advance the agenda. Look, I appreciate the call out there, Janet, extremely, very much. Looky here. This is from Breitbart. A report that Joe Biden is seething behind the scenes despite all of these contrite videos. Apparently Bite Me is out there making all these videos about how sorry he is and never intended to offend anybody and, gee, it was a different time then than it is now, and he’s gonna have to get with the times. He’s gonna be working really hard. So he’s doing all that, but behind the scenes he is reportedly seething. And his seething is aimed at Crazy Bernie. Bite Me believes that Crazy Bernie’s campaign is behind all this media scrutiny of Bite Me’s hands and lip movements when women are involved and around and so forth.